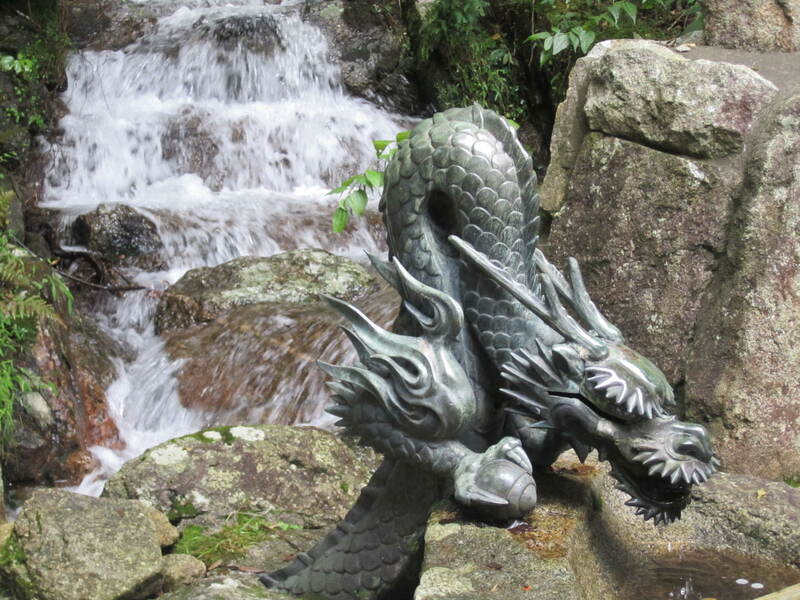 Yamanomiya, Mountain Shrines of Mystery, has posted an article on the Kitakami River and its source, the Yuhazu spring in Iwate. 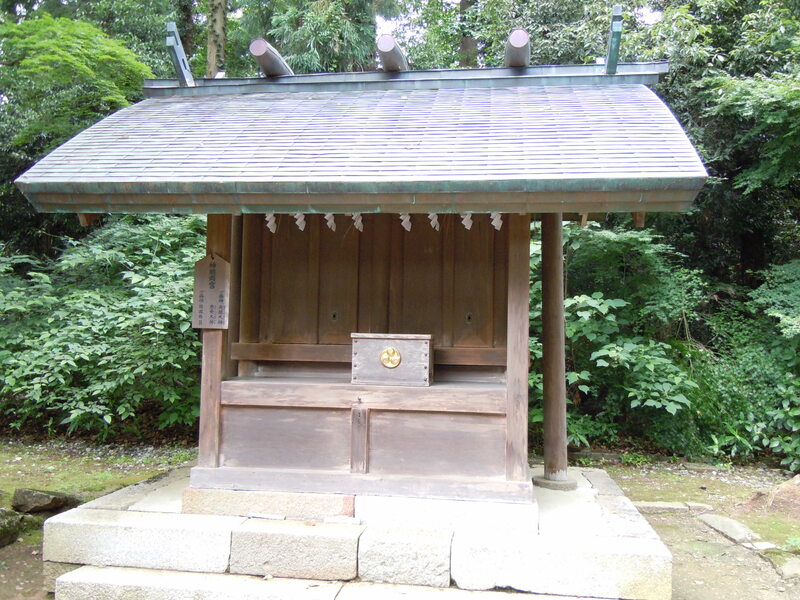 The Yuhazu spring is on the grounds of the Mido Kannon Temple. This modest spring is said to be the source of the mightiest river in Tohoku. This entry was posted in Hitakami, Hotsuma, Seoritsuhime and tagged Iwate, river on 2017/07/26 by Okunomichi. This Castle Was Built by Shogun Ono-no-Azumabito in 724. In 762, His Majesty’s Commanding General Emi-no-Asakari Supervised Repairs. Photos taken at Tagajo, seat of ancient government, outside of Sendai, on October 12, 2010 below. Above is photo of the monument displayed in the museum. The image has been enhanced to enable reading of the inscription. The actual engraving is quite illegible as my Tagajo photo shows. This entry was posted in Hitakami, Hotsuma and tagged Hitakami, Hotsuma, Taga, Tagajo, Toyoke, Tsubo on 2013/10/01 by Okunomichi. In search of Toyoke, in June 2012, we visited Taga Jinja in Tagajo City, Miyagi ken. 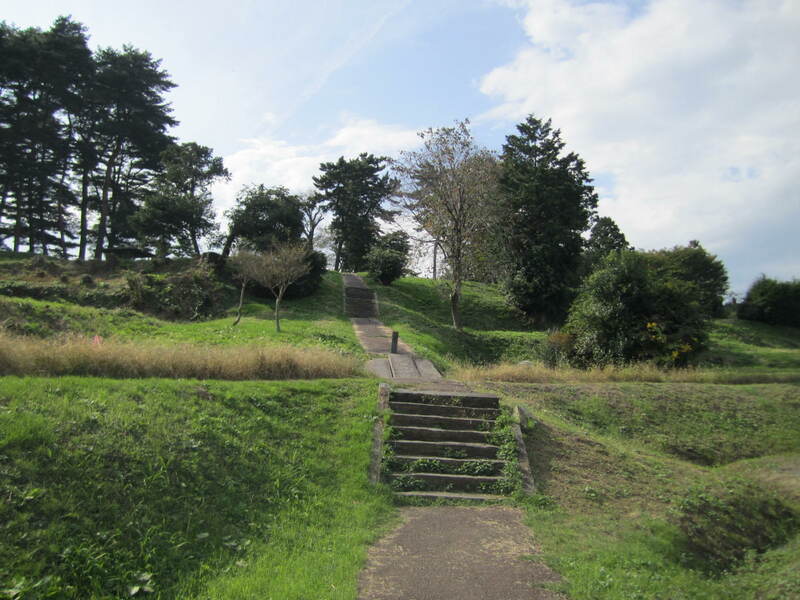 Southeast of the Mutsu government ruins, it is next to the Tagajo old temple ruins. It is listed in the Engishiki. 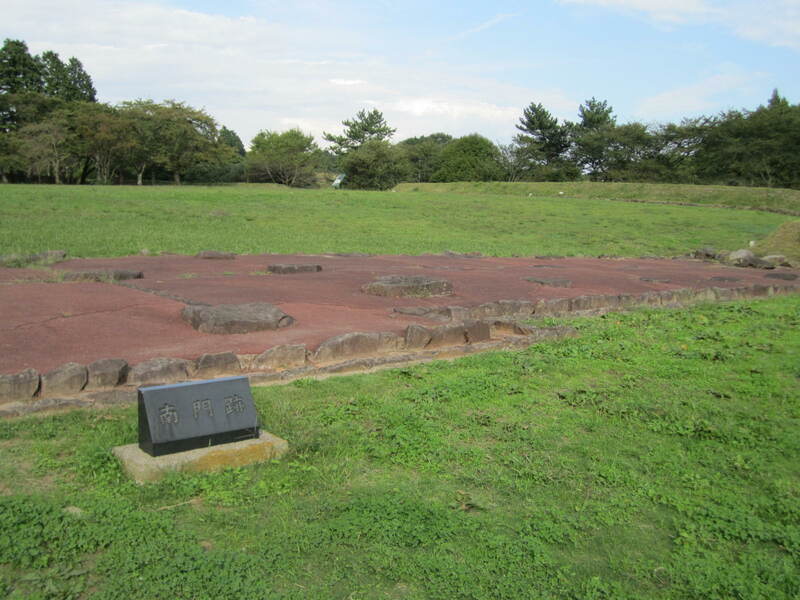 Previously, in 2010 we had seen the two small Taga jinjas at the Mutsu government ruins, also in Tagajo City. At that time, we had felt Toyoke’s presence. But further study indicated that there is a Taga Taisha in Omi, now Shiga-ken, and that it was split off from a Taga Jinja in Mutsu. 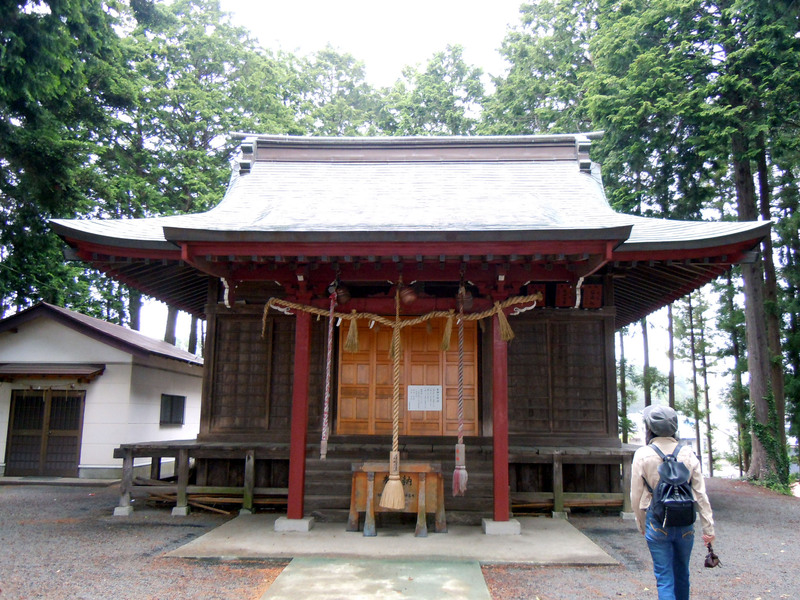 We now believe that this Taga Jinja is the origin of the large taisha in Shiga. We parked in front of a large public space which turned out to be the iseki ruins of a ceremonial site of which little is known; the local government is calling it an old temple site, even though they have no evidence that it is Buddhist. Walking out to the road, we saw a sign indicating that the Taga Jinja was this way. This is the first view we had; notice the ‘old temple site’ on the left. We see the white sign and the torii entrance on the right. The jinja is quite charming. Should we call it a hokura instead? It’s barely large enough for one person to pray at. 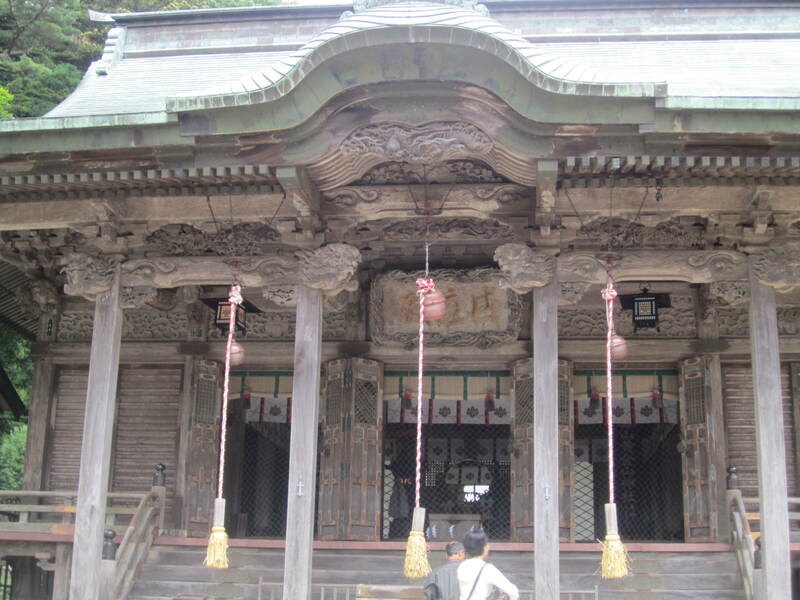 If you enlarge the fourth photo by clicking on it, you’ll see the sun and moon carved into the doors of the haiden-honden (there is no separate honden). We stayed for a while here because it felt so serene and comforting. Mr. Takabatake of Japan Translation Center says that the Taga jinjas are the former palaces of Amateru’s son and heir, Oshihomimi. ‘Taga’ is the posthumous name of Isanagi. ‘Ta’ means to order, to put right, to save. ‘Ga’ means darkness. Thus, Taga would mean to put darkness to order. 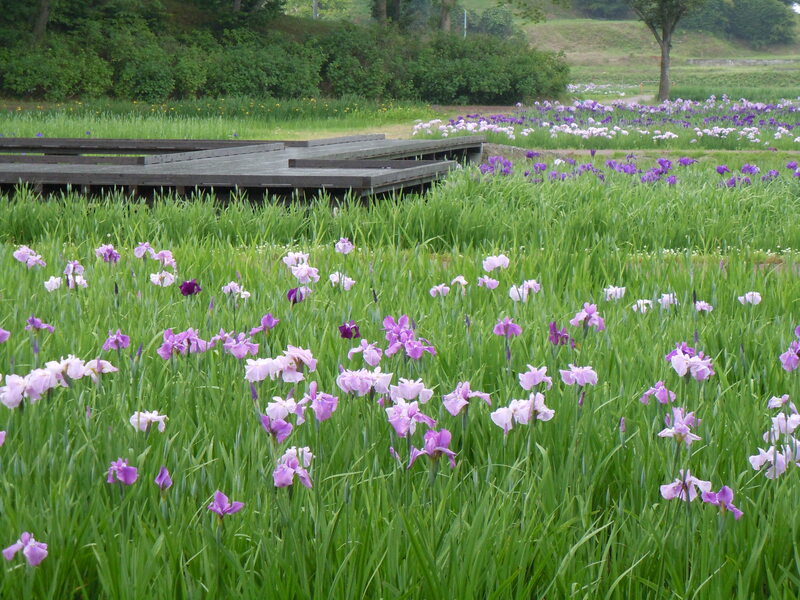 We wanted next to see the famous iris gardens of Tagajo City, so we parked near the train station and started walking. On the way, we came to the hill – or is it a man-made mound? – that we had seen on our earlier trip. We decided to take a short cut by going up then down the other side. 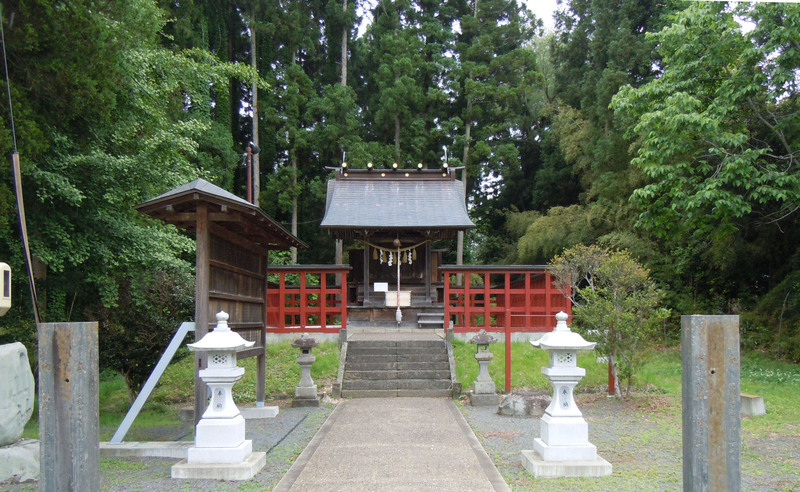 The kaidan turned out to be the entrance to a small shrine. 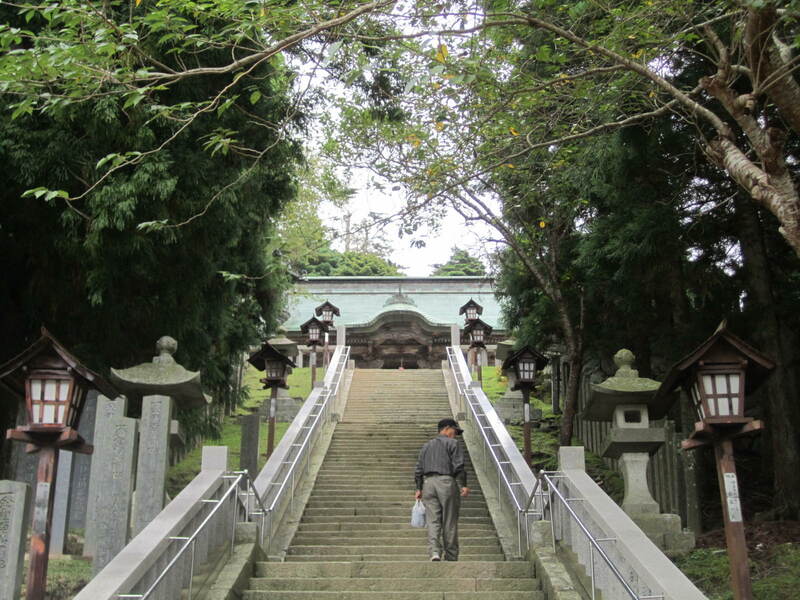 Tonight’s research revealed its name, Ukishima Jinja, and that it is somehow connected to Taga Jinja. Was it a coincidence? 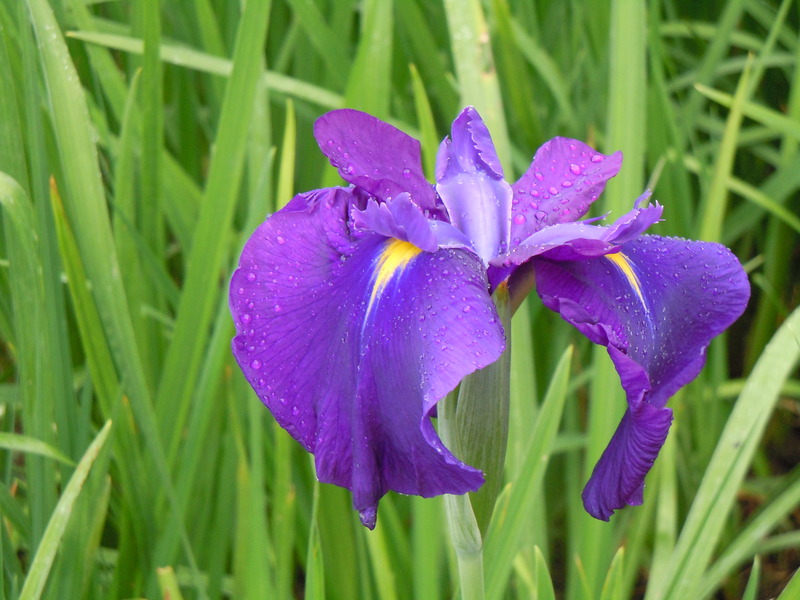 We walked down the other side of the hill and across two roads and finally found the iris growing in profusion. We had missed the peak season, but it was splendid just the same. This entry was posted in Hitakami, Hotsuma, Jinja and tagged Toyoke on 2013/10/01 by Okunomichi. Kinkasan (金華山 Kinkasan?, or Kinkazan) is a small sacred island in Miyagi-ken in Tohoku. It is considered one of the Three Holiest Places in the region It lies in the Pacific Ocean off the Oshika Hantou Peninsula in Sendai Bay. 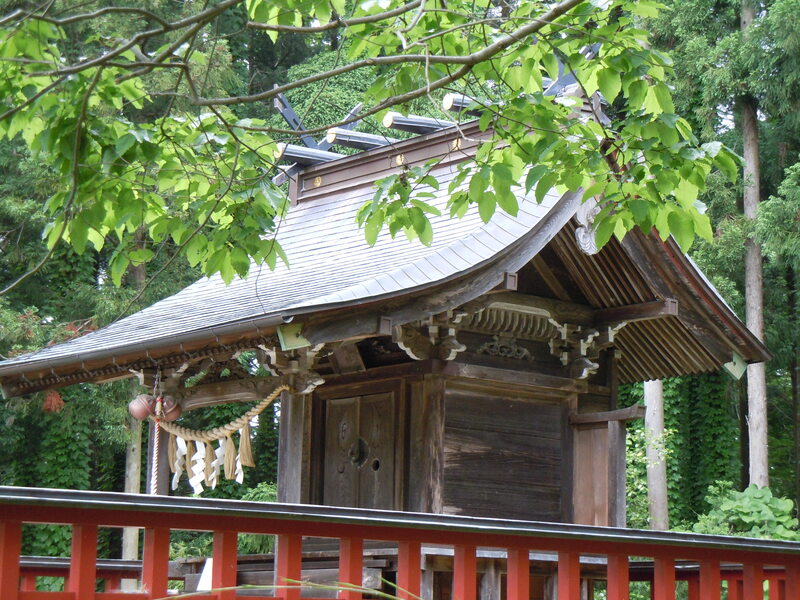 The shrine on the island is called Koganeyama-jinja. The Oshika Peninsula was the closest part of Honshu to the epicenter of the March 11, 2011 Tohoku earthquake. It was heavily damaged and many died there. It was less than a year before that that we visited Kinkazan. Kinkazan means mountain of gold flowers, for gold was mined there in historical times. Still, Kinkazan has been a sacred island since ancient times. It is on the Hotsuma map of important places. And ‘gold flowers’ reminds us of the golden flowers that bloomed when the youthful prince Amateru went to Toyoke’s palace to study Amenaru-michi. Kinkazan is a one-mountain island and is (was) easily reached by small boat. A bus took us up to the Koganeyama Jinja. Koganeyama Jinja is a shrine for prosperity, its two main kami being Ebisu and Daikoku. You can buy any number of amulets and charms, including large decorative pieces called kumade. Kumade means rake, and the decorations are attached to a stylized rake. Deer abound as they are under protection there. 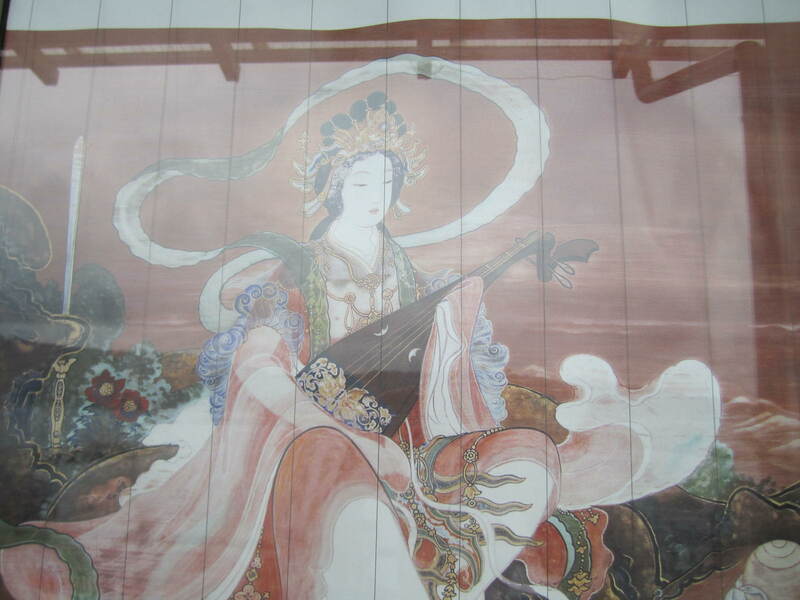 There is a charming painting of Benzaiten, goddess of water, speech, and music. It was a lovely place to visit, and we hope that it has recovered since the disaster. We visited Ishinomaki City two years after it was devastated, and found promising signs of recovery. See our other post. Sendai Bay is in Miyagi Ken. 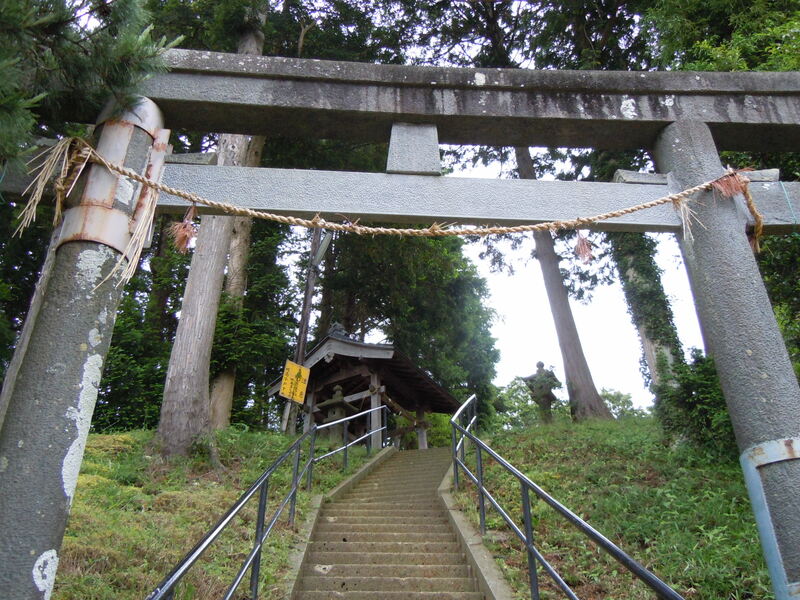 This entry was posted in Hitakami, Jinja and tagged jinja, Miyagi on 2013/06/23 by Okunomichi. During the time of the 6th Amakami Omotaru [Amakami is the ruler of Hotsuma], the weather changed and there was not much food. Toyoke was born in the family of the Takamimusubi, the ruling family of Hitakami in what is now called Tohoku. He was named Tamakine. Toyoke governed Hitakami as the 5th Takamimusubi. He organized ceremonies for kami so that people could pray together in the same manner. He made the Futomani Motoake chart. Toyoke was successful in increasing food production for his people. He was called Higashi-no-kimi, King of the East, and also Hotsuma-kimi. The people bestowed upon him the name Toyoke, or Toyouke. Here, ‘toyo’ means abundant, ‘u’ means greatness, and ‘ke’ is food. Since the 6th Amakami Omotaru had no children, Toyoke resolved to find a solution. He asked his daughter Isako to marry Takahito and they would serve as the 7th Amakami. Takahito was the eldest son of Awanagi, ruler of Ne-no-kuni. 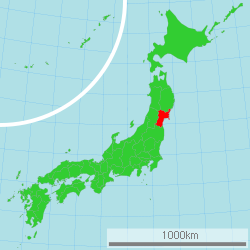 This was the area known today as Hokuriku at the Sea of Japan and including Ishikawa and Toyama prefectures. The couple became the 7th Amakami, Isanami and Isanagi. For a long while they had no children, and Toyoke was concerned that there would be no heir to rule Hotsuma. By his earnest praying a prince was born. This child became the 8th Amakami, Amateru. 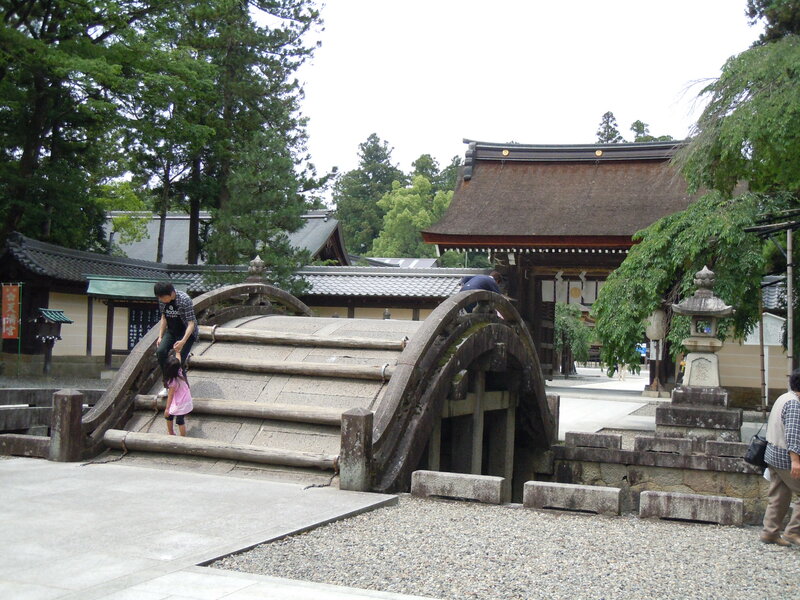 Toyoke taught the young Amateru together with another grandson, Furimaro, in the Yamate Palace at Tagajo. The latter became Takagi, the 7th Takamimusubi, after his father Yasokine / Kanmimusubi. Toyoke excelled at government, engineering, and education. He taught about horseback riding, obstetrics, metalwork, and yuki-no-michi. 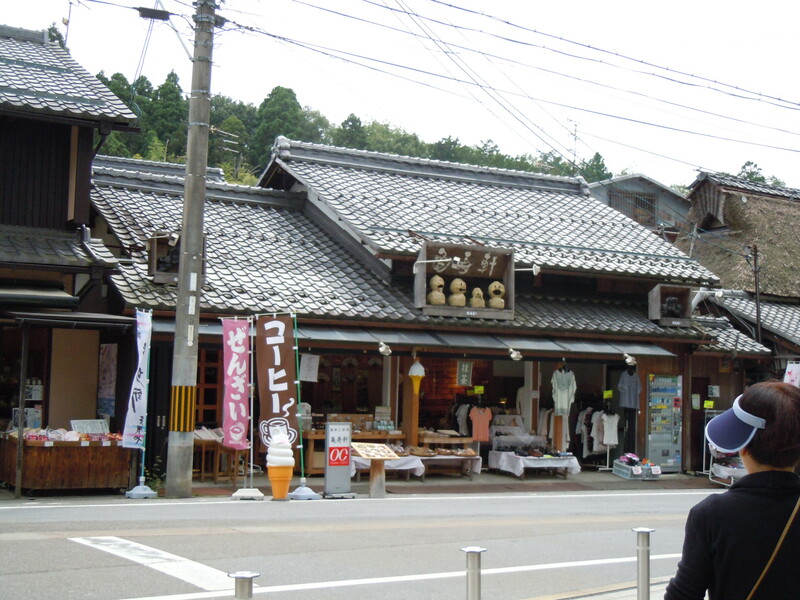 Late in age, Toyoke was asked by Amateru to govern the San-in region, so he relocated to Miyazu in Tango (now Kyoto-Fu). When Toyoke knew he was about to die, he had a hokora tomb dug in the Kujigatake mountain of Mineyama-cho, 20 km northwest of Miyazu. He entered the tomb while still alive – this is called Toyoke-nori. He is deified at the Hinumanai Jinja at the foot of Kujigatake. 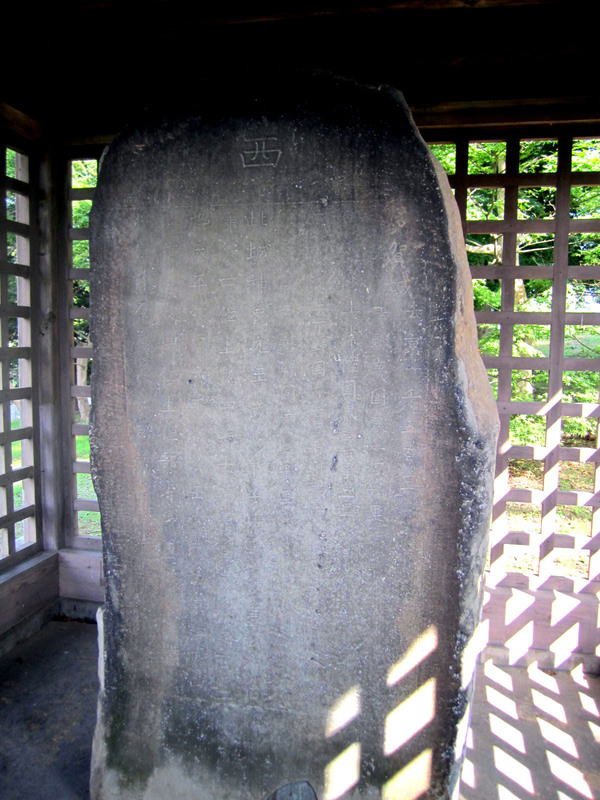 Amateru, later, was also entombed at Kujigatake. Note: As Ikeda exclaims, Toyoke cannot be compared with anyone else. This is exemplified by Toyoke creating the Futomani chart to teach the Way. That is why we are devoting many posts to the life and teachings of Toyoke. We have also visited his shrines in Hitakami, Omi, and San-in, as well as the Geku of Ise Jingu and the Moto-Ise shrines of Tanba. This is an edited excerpt from the encyclopedia of Ikeda Mitsuru, 1999, 308pp. This entry was posted in Hitakami, Hotsuma, Kyoto Fu and tagged Amateru, Tagajo, Toyoke on 2013/06/09 by Okunomichi. Kunitokotachi had eight sons who are called the Kunisatsuchi. Their names are: To, Ho, Ka, Mi, Ye, Hi, Ta, and Me. Their full names are, for example, To-no-Kunisatsuchi. They were each given a land to rule and develop. To-no-Kunisatsuchi arrived at the Land of Hotsuma bearing seeds of plants and trees. The center of Hotsuma was at Harami, now called Mt Fuji. He planted the eternal tachibana orange tree on Harami and called it Kaguyama, Fragrant Mountain. In the Land of Hitakami, to the east-north-east, now called Tohoku, the descendant of Ta-no-Kunisatsuchi was the Fifth Takamimusubi, Tamakine. The Heavenly Realm, Takamagahara, was created at the palace in Tagajo. It was so abundant a land that Tamakine was given by the people the name Toyoke, the Receiver of Plenty. Toyoke followed the Amenaru-Michi, the Way of Heaven, prescribed by Kunitokotachi. 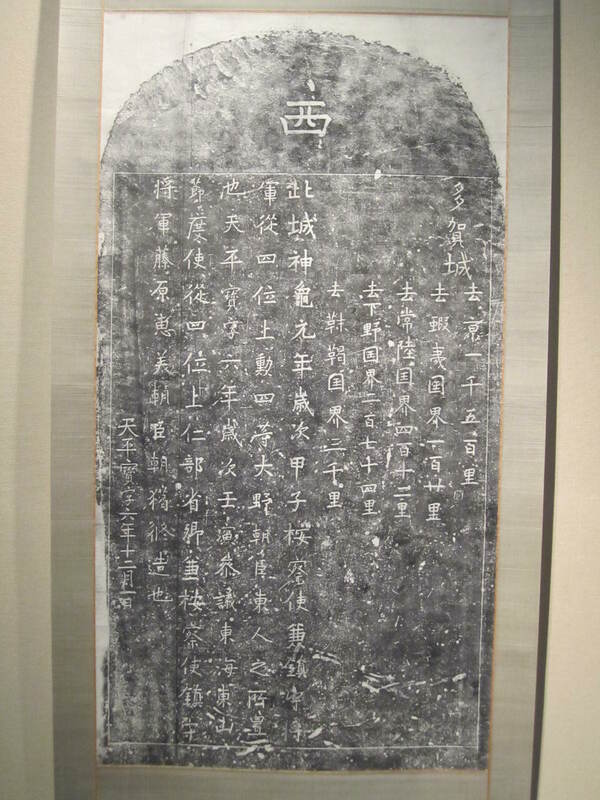 Ka-no-Kunisatsuchi went to China and became an ancestor of Nishi-no-Haha, Mother of the West, known by the Chinese as Xi Wangmu (or Hsi Wang Mu). She came to Toyoke to study with him and returned to China bearing a plant of the fruit-bearing peach tree. This entry was posted in Hitakami, Hotsuma and tagged Kunisatsuchi, Toyoke on 2013/06/06 by Okunomichi. Taga Jinja in Tagajo-shi sent part of its kami spirit to Taga Jinja in Omi. This jinja has become Taga Taisha near Biwako in Shiga Ken. 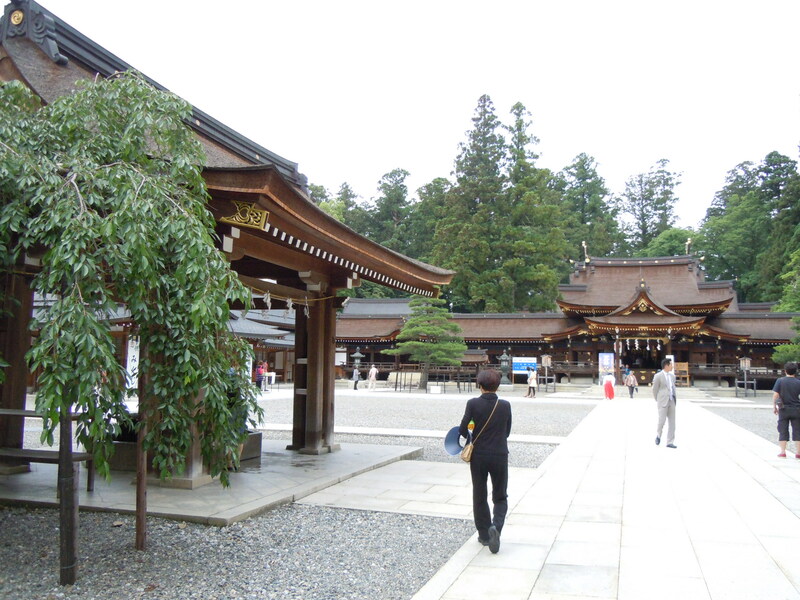 I visited Taga Taisha in June, 2012. We had yummy tempura ramen across from the entrance torii. Later we went back for matcha soft cream. Also yummy! There is a semi-circular bridge just past the entrance torii. It is supposed to be good luck to go over it, and young children have a ball clambering over it. It is rather difficult for adults to traverse. 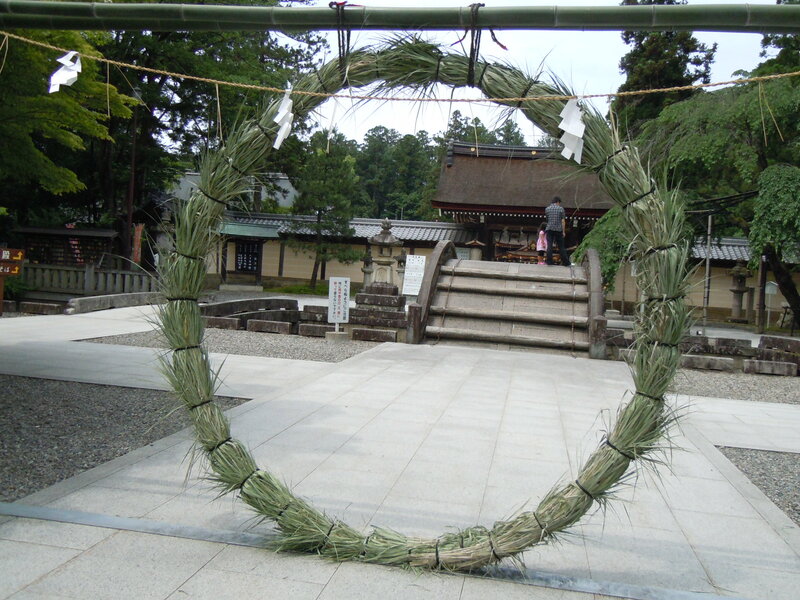 There was also a circular green shimenawa called a chinowa made of grass or reeds. 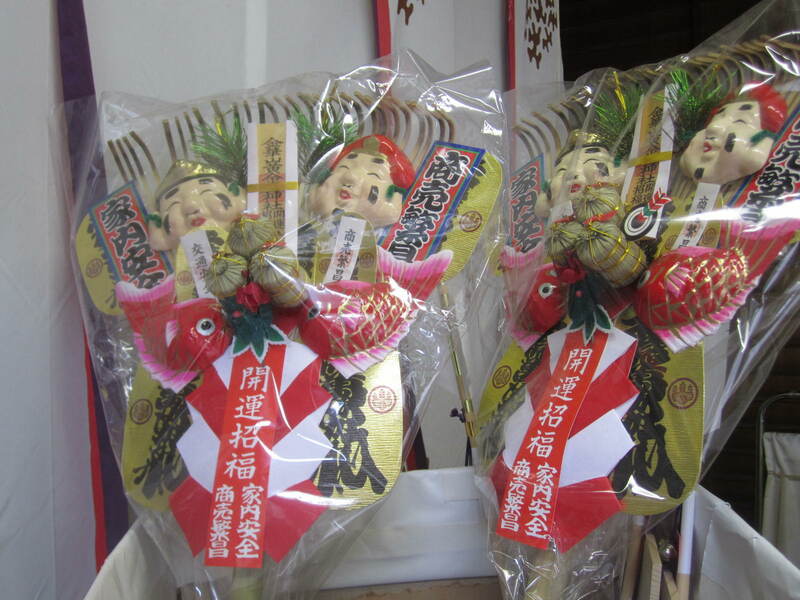 Passing through a chinowa is said to bring good luck. The keidai shrine precinct is very large and it must accommodate nearly a million visitors on Hatsumode on New Year’s Day. We looked for a a trace of Toyoke Okami. We finally found it on the side, rather than in the back where we would have expected old, original jinja to be found. 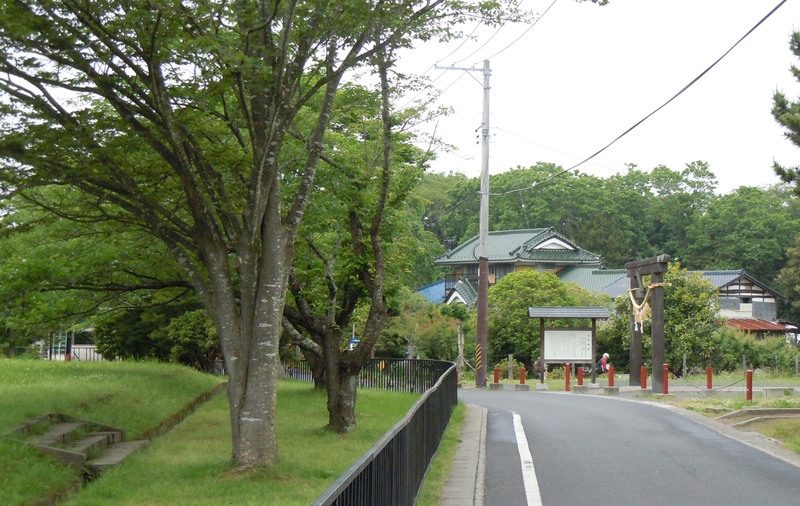 This is where the original Taga Jinja would have been, after it was sent here from Tagajo in Miyagi. 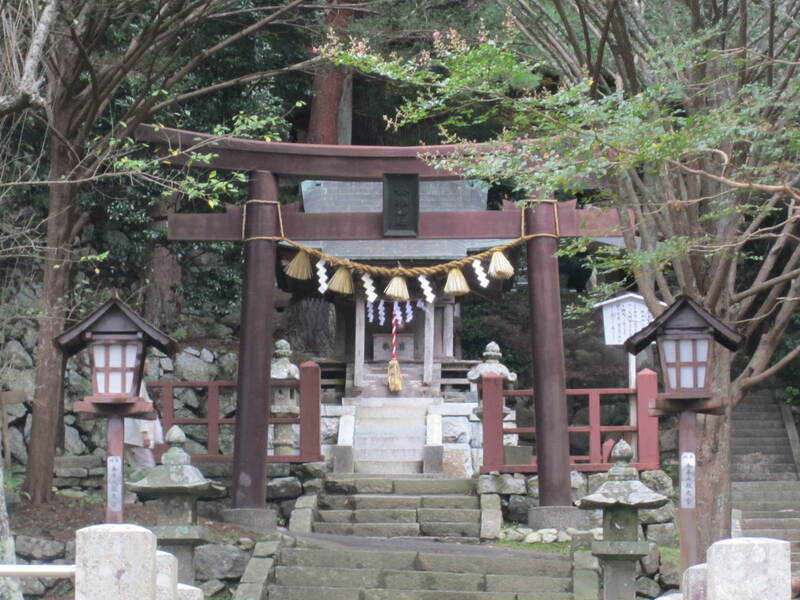 This entry was posted in Hitakami, Hotsuma, Jinja and tagged Omi, Shiga, Taga Jinja, Toyoke on 2013/06/04 by Okunomichi.